Early last month Peter Turchin published a couple of posts on whether or not the "Great Divergence" (sometimes called the 'Rise of the West' or 'the European Miracle') can be approached scientifically. Both posts were excellent, and as is usual at Professor Turchin's place, the comment thread that followed the posts was of exceptional quality. These discussions focused on how difficult it is to use the scientific method to explain an event--like the Great Divergence--that is singular and unique (as opposed to using the scientific method to explain something that has happened many times, like the rise and fall of civilizations generally). As I reflected on these discussions it occurred to me how important questions are to both the historian's craft and the scientific method. The answers you get depend a lot on the questions you ask. These posts ask "Why did the great divergence between the West and the rest happen?" I would start somewhere different. Before we can attempt to explain why the West diverged from the rest we must ask: which divergence are we talking about? During this revolution human energy production and consumption, population size, wealth, technological capacity, and knowledge all began to increase at an exponential rate. This constant expansion of human resources is the defining feature of our time. Ours is an exponential age. This revolution happened first in Europe, taking the better part of two centuries to spread to the rest of the globe. This time lag accounts for the diverging fates of each region; in a sense the story of the Growth Revolution is the story of the Great Divergence. As Turchin notes, there are a lot of theories explaining why this happened. Many of these run befoul the same problem mentioned in this post's introduction: they answer the wrong question. They jump so quickly to the why of the Growth Revolution that they never stop to ask what the Growth Revolution really was. 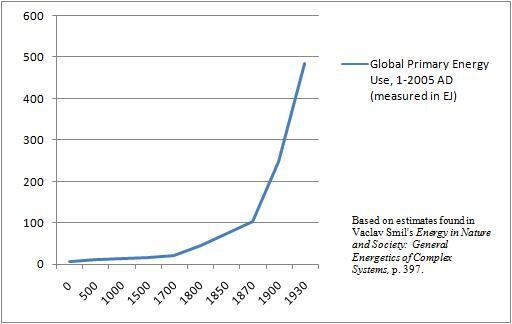 Between 1760 and 1820 Europe's wealth exploded - and so did its energy use. The two trends are intimately related. I have discussed the relationship between energy use and wealth several times before , but to re-cap: while definitions of wealth vary with time, place, and culture, wealth is not a mere social construct. It reflects physical goods and services. These goods and services are produced by people or the machines and animals owned by people. We can measure these things in energetic terms because everything a human, animal, or machine does comes at a specific energy cost. "Wealth" is really just the word we use to name the goods created and services rendered through our energy use. Energy is a universal that unites the natural and human sciences. Ecologists devote a great deal of their efforts to understanding how energy "flows" through an ecosystem. Adopting the same approach when studying human societies provides valuable insights. When human history is seen in energetic terms the source of the premodern world's snail-pace economic growth is immediately apparent: premodern peoples were limited by the energy they had access to. As long as they were dependent on human and animal power their ability to create new wealth would be permanently frustrated. The exponential explosion of European wealth during the 1800s was the direct result of the explosion in Europe's energy use during the same period. With this knowledge we can amend the original question. "Why did the West diverge from the rest?" is replaced with the more focused "Why did Western nations have the technical and scientific expertise to pioneer non-animate energy sources and an economic system that allowed these new methods of production to spread across the West?" The answer to this question extends far beyond 1820. Searching for the origins of 19th century Europe's unique institutions and technology leads to an interesting conclusion: the West began to diverge from the rest long before the Growth Revolution. Estimates in millions of 1991 USD. Taken from Angus Maddison's Contours of the World Economy, p. 367. In terms of total wealth Western Europe did not break ahead of China and India until after 1820. Before then Qing dynasty had more wealth at its disposal than every country in Europe combined. From this view it seems pretty clear that the West did not pull ahead of the rest until after their epochal jump into the Growth Revolution. Estimates of GDP per capita in 1991 USD. Taken from Angus Maddison's Contours of the World Economy, p. 367 and revisions made in the January 2013 New Maddison Project Database. Although China's total wealth quadrupled between 1500 and 1820 its per capita wealth did not budge. In contrast to the economic dynamism of China's medieval economic revolution, almost all of China's post 1400 growth was due to population growth. Reminiscent of China's gains in in the 11th and 12th centuries, Northern Italy's GDP per capita surged between 1000 and 1500, but then afterwards stagnated. India and the Ottoman Empire performed no better, never managing to pull off their own surge in productivity. Things were different along the North Sea. Both Great Britain and the Netherlands had sustained GDP per capita growth for more than 600 years. In Great Britain the growth never stopped. Notably, it was in these two regions the technical advances of the Growth Revolution - first with peat in the Netherlands, then with coal in Great Britain - occurred. This process began before the European conquest of the Americas, the invention of printing, the creation of modern finance institutions, the Atlantic slave trade, or the Protestant Reformation. None of these can be proper explanations for this "little divergence." So what is? That is the really interesting question. Rather than focus on why Europe diverged from the rest in 1800 we should be asking why the North Sea diverged from the rest in 1000. EDIT (19/11/2013): Please see the update to this post- "Another Look at the Rise of the West--With Better Numbers." Peter Turchin. "The Rise of the West: Science and Ideology." Social Evolution Forum. 3 June 2013 and Peter Turchin. "Cliodynamics of the Great Divergence (AKA the Rise of the West)." Social Evolution Forum. 7 June 2013. T. Greer. "Notes on the Dynamics of Human Civilization." The Scholar's Stage. 4 August 2013. See "Notes on the Dynamics of Human Civilization" and T. Greer. "Energy Use and Economic Growth: Some Basic Facts." The Scholar's Stage. 13 March 2013. Those wishing for a more technical over view are advised to consult David Stern "The Role of Energy in Economic Growth." CCEP Working Paper 3.10. October 2010. The numbers for China and Italy deserve special comment. The Maddison Project economists revised Maddison's estimates for Italy considerably. However, their estimates do not extend to 1000, so I used Maddison's existing estimate for that slot. If their other revisions are anything to go by, $500 is probably much lower than Northern Italy's true GDP per capita in 1000. Likewise, I am inclined to think that Maddison slightly under-estimates China's GDP per capita increases during 1100-1300. See Mark Elvin. Pattern of the Chinese Past: A Social and Economic Interpretation. (Stanford: Stanford University Press). 1979. p. 113-203 for a good summary of the evidence that informs this inclination. If these estimates of pre-1800 income per capita are right, and no doubt some will dispute it, then it was a very significant divergence. I'm awaiting a future post on what you think the explanation may be. I don't know, but that date is oddly close to when the Absolute Nuclear Family started to get going in the same region. Whether cause or effect or merely correlated I don't know. Curiously enough, that is also around the date when Spengler claims that the Western culture began. The best question there is. Answer that, and everything else falls into place. I don't know if you're read Matt Ridley's The Rational Optimist. He interested me by taking a longer view and more gradual progress, rather than the usual pick a date and explain the explosion. Draw the domain and range and the leap from 0.30 to $3.00 a day looks explosive. I have confidence in the general contours of the estimates, though I think they will be altered and refined for a long time to come. The Maddison Project is a good start on this count. 1. It seems pretty clear that (perhaps as JK's Matt Ridley might suggest), most of the pre-industrial growth in GDP per capita was due to the specialization and division of labor, just as Adam Smith said it was. But what allowed all of this to happen? I am afraid I do not know. I have suspicions. But that is all they are - suspicions and hypothesis that need further testing. As Turchin suggests, it is hard to prove an explanation for a unique event. I suppose the stalled "surges" in productivity in China 1100-1300 and Italy 1000-1500 might be good places to start. As with the North Sea, both of them saw urbanization, technological innovation, and pretty spectacular economic specialization. But they could not sustain the growth. Figuring out what the North Sea had that Song China and Renaissance Italy did not might provide the answer. If nothing else, they would increase the number of case studies considered from 1 to 3. Craig Willy. "Emmanuel Todd’s L’invention de l’Europe: A critical summary" EU Affairs Writer. 7 July 2013. "The Clan and the City: Sustaining Cooperation in China and Europe"
"Risk, Institutions and Growth: Why England and Not China?" Mark Elvin, "The high-level equilibrium trap: the causes of the decline of invention in the traditional Chinese textile industries"
"GIRLPOWER: The European Marriage Pattern (EMP) and labour markets in the North Sea region in the late medieval and early modern period"
The latter author also has a book titled The Long Road to the Industrial Revolution: The European economy in a global perspective, 1000-1800 that is probably of great help in understanding all this. Alas, at $218 a copy I will not be reading it soon. As Adam G. suggests, the ANF (and more generally famly life inside the Hajnal line ) is an important part of this story. But I don't think it is the whole story. Just an important part. Its a moot point whether China would have managed it, but the ingredients were there. England had Coal, waterways, access to finance, trade links, export markets, and in general Peace. They stayed out of the religious wars, and the 30 years war. They reconciled themselves mostly to the French system until they began to destroy it during the 7 years war. My guess would be the economic and environmental factors dovetailed nicely with an extended period of peace in Atlantic Europe (apart from usual series of small border wars there was no large great power coalition war). What applied to England also applied to the Dutch, abet on a lesser scale. The dynamism of the Song continued past the Mongol conquests. The spectacular economic activity seen by Marco Polo, for example, was during the Mongol-led Yuan Dynasty. The general decline in paper currency, outside trade links, and innovation did not happen until the Ming took power and pushed the Mongols out. "My guess would be the economic and environmental factors dovetailed nicely with an extended period of peace in Atlantic Europe (apart from usual series of small border wars there was no large great power coalition war). What applied to England also applied to the Dutch, abet on a lesser scale." Which time period are we thinking here? The Dutch, in particular, seemed wrapped up in one major war or another from the 16th to 18th centuries (the same time their growth was greatest). If viewed in energy use within the society, the Mongols had a hugely negative impact on China. Its testament to chinas cultural magnetism that they managed to absorb and channel the Mongol invasions. Those invasions, which if I recall correctly involved massive and long lasting warfare. I think it took upwards of 600 years before energy use recovered to pre-mongol times. I'm talking about the 120 years between the end of the religious wars and the out break of the 7 years war. This also coincided with the exploitation of the north atlantic trade by the Dutch and English, the value of which lead in the end to war between the two onetime allies. I don't claim any great insight, most of this is regurgitated from "Why The West Rules"
It attempts to give a explanation for the rise of western europe. Fine blog by the way. Do you know Ian Morris' Book: "Why the West rules?" "The west rules because in great britain of 1850 the humans start using fossil energy for their needs". Or in other words: Mankind started to use the virtual slaves contained in coal. "On the energy usage explosion being a critical element, I agree. But I think saying that the Northern Sea or even Britain diverged in 1000 is a stretch. One of my favourite papers summarising much of the research on this topic is Jack Goldstone's 'Efflorescences and Economic Growth…' which can be found here http://www.csun.edu/~jaa7021/hist531/Goldstone%20-%20Efflorescences%20and%20Economic%20Growth.pdf. The pre-19th century growth is still of a fundamentally different character and even in the 18th century, Chinese growth from 1680-1780 was more impressive than British growth. The Smithian vs Schumpeterian distinction is probably quite a good one. In Goldstone's terminology, there were a lot of efflorescences but none of a self-reinforcing accelerating character till the 19th century. Obviously energy is the big story but you could still ask the question why first in Britain? " "First off, thank you! Goldstone was great.... Thank you. I don't think Goldstone's position is in conflict with my own. His particular animus are those folks who try to stretch pre-modern growth back past the 1800s, and on this count I am with him. Economics before the Growth Revolution were of a fundamentally different nature than that which came after. The dynamics of human civilization itself have changed - and the change has been no less revolutionary than the transition from small hunter gatherer bands to complex societies 11,500 years ago. I was calling them "surges", but I think his term "efflorescences" captures their nature better. He makes a very compelling case for including High Qing times among the most dramatic of these efflorescences. But I am not convinced that the Qing's impressive accomplishment dim the North Sea's any less. The surges that come with the Cathedral Age and Dutch Golden age efflorescences (discussed extensively by Goldstone) are easy to see. What is interesting is what happens when the efflorescences end and what happens before they begin. In the Netherlands there is a period of 50 or so years (1600-1650) where GDP per capita falls. England has its own drop from 1550 to 1600. But other than that, GDP per capita in both countries always increases. This was not modern 'kunzian' growth. There was nothing modern about any of this. Not even close to it. But it is a significant divergence from what was happening with the rest of the world. Goldstone concedes that a dynamic of this type was happening on pg 56: "Nonetheless it appears from the long term growth of cities, the size of bureaucratic and mercantile groups, and improvements in the consumption of consumer goods such as housing, textiles, pewter plates and cutlery, that while average workers may not have fared greatly differently in the fourteenth and eighteenth centuries, at the later time English society also supported a much larger and wealthier middle and class and elite stratum..... thus societies as a whole seem to become richer in successive efflorescences, even if this may not be evident at the lower levels of the social pyramid." "This article tests recent ideas about the long-term economic development of China compared with Europe on the basis of a detailed comparison of structure and level of GDP in part of the Yangzi delta and the Netherlands in the 1820s. We find that Dutch GDP per capita was almost twice as high as in the Yangzi delta.Agricultural productivity there was at about the same level as in the Netherlands (and England), but large productivity gaps existed in industry and services. We attempt to explain this concluding that differences in factor costs are probably behind disparities in labor productivity." Both the Dutch and the Qing were a century past their prime by this point. 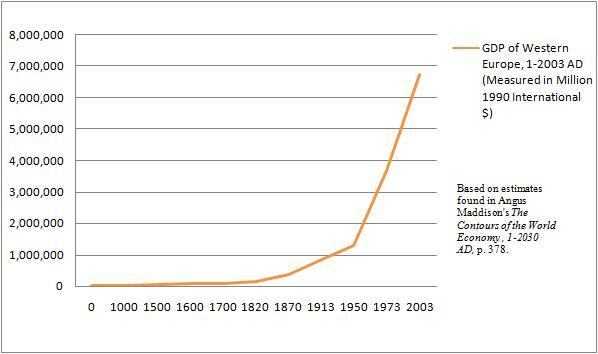 But the GDP per capita of the Dutch was still twice as large as the GDP per capita of Qing Yangzi delta. That is the type of North Sea divergence I find so interesting. Of course, the expansion of the North Sea middle class and the growing wealth of Britain and the Netherlands 1000-1800 might not be directly related to the reasons Britain pulled off an energetic revolution c. 1820. I am not sure how closely connected the two events are. But it is hard to figure out if the two events are related if we don't have a firm grasp on why England had the post 1000 trajectory it did - thus my post. Paul Kennedy made the excellent point in his "The Rise and Fall of the Great Powers" that at time of the Opium War the 8 million or so English still had a lower total GDP than the Chinese which numbered 140+ million. Still, the Royal Navy beat the Qing forces with tantalizing ease. This is because total GDP has little meaning in itself. In peasant societies like 19th century China most of the wealth goes from hand straight to the mouth as they say. It is rather the surplus that counts and mercantile countries like England and Holland, but also most of the other European states had an early economic advantage in this respect. Yet, even the importance of GDP per capita should not be exaggerated in pre-industrial societies. E.g. Maddison gave 600$ for China between 1500 and 1820, its highest income up until then. But this is an increase of only 30% compared to 1 AD (450$), not much for a span of almost two thousand years. In fact, according to his calculations the Chinese maximum level of 600$ had already been reached - passingly though - by Western Europe as early 1 AD. So where is the income development here, where is the claimed divergence before the real industrial divergence? The data rather indicates that China of all developed laterally for two thousands years. Looking at GDP per capita would cast extreme doubts on Pomeranz's book The Great Divergence, in which he posits that in 1760 the most advanced areas of Europe were no more advanced than the most advanced areas of East Asia. He suggests the Divergence only occurred because 1. Great Britain had coal easy to get to near industrial areas (China's coal is far away to the north, even today they often buy international ocean-bourne coal instead) and 2. Europe had access to the New World: essentially unlimited resources but not unlimited labor to extract them (China's sketchy access to Siberia was not as convenient). One way to look at advancement is energy use per capita but what it really is is labor productivity. Once you get on a path to high labor productivity, you keep investing more capital per worker, using more energy, making more inventions, and progressing. On the low-labor productivity front, you stagnate. Just throw more coolies at the problem. I always had some doubts about Pomeranz because it seemed to me that as early as the Middle Ages, European inventions were focused on labor productivity: improved watermills, windmills, horse collars. Chinese inventions were often clever but not labor saving: underground cotton spinning cellars in north China so cotton could be spun in the damp in the winter, extremely high agricultural land productivity with 3 crops of rice in the Pearl River Delta. So I would guess that Europeans' lower population density and the Black Plague were already pushing them toward labor productivity as early as the Middle Ages but it took a long time for the eventual results to show up. But when they got coal, they were ready to use it, already having a long history in mechanics and labor saving devices. In contrast, say, the Romans were clever engineers but didn't bother much with labor productivity -- who cares when you can get unlimited slave labor by conquering someone? One explanation I have heard is the European family structure. Europeans married monogamously, and later, than the Chinese, Indians, and Arabs did. This prevented massive population growth and allowed Europeans to enjoy more resources individually, while resources elsewhere were put into population growth. "GIRLPOWER: The European Marriage Pattern (EMP) and labour markets" article I linked to in my first comment. H. Michaels and Doji Star suggest that looking at GDP per capita and excess income is the way to go, and I agree... thus this post! But saying that China simply developed "laterally" for 2,000 years is a bit more extreme conclusion than history supports. The Maddison data is a bit troublesome on this point. By choosing years 1000 and 1500 we miss both the efflorescence of Song dynasty (hitting its high point c. 1300) and the economic decline of the Ming (c. 1400). Well, to be precise it was not the Chinese state which conquered everyone, but the Manchus who had first conquered China in its entirety and then operated from its territory. This is another interesting point: the curious military weakness of the indigenous Song and Ming dynasties which is at odds with the picture painted of a vital Chinese economy and strong bureaucracy. See my recent post on the Qing Dynasty Kangxi emperor (and the comment thread) for some speculation on that point.